Liberty of Conscience crushing Tyranny. 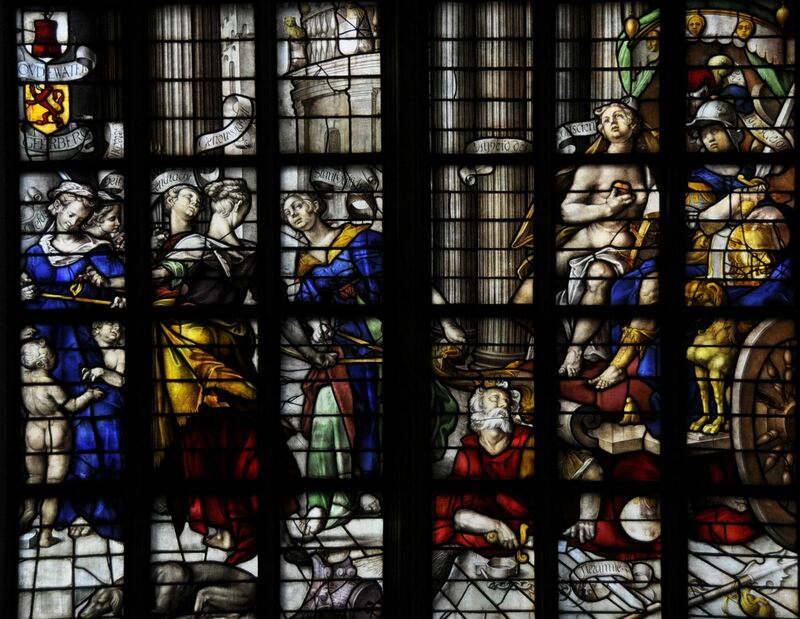 One of the windows in the church of St John, Gouda. Fourteen years ago, I published a small Dutch book, Hollands glorie, which offered a history of the Dutch consensus culture, from its very beginnings to the latest developments, covering more or less the millennium that was, in 1999, coming to an end. Reprinted several times, it was completely revised and republished in 2005, this time called Polderdenken. The text, which I have decided to call Consensus and Crises, has been translated by my friends Marie Smit-Ryan and Bill Thayer, and I have made a web version, which you can find here. Parts of it have been adapted, because I cannot reasonably expect foreigners to know Dutch topography. Most illustrations are from Amsterdam – I’m an Amsterdammer after all, and proud to be one – but I hope to add photos from other towns as well. The text is about 35,000 words and tries to explain why the Dutch political system is currently in crisis, but this precise theme has not prevented me from digressing on things I found interesting. Again, you can find it here. I hope you will enjoy it. I have never met Mr Charlot from France, but he occasionally sends me photos from Iran, where he visits places that I never visit: Kurangun, Guyum, Qadamgah, Sarab-i Bahram, and Sarab-e Qandil. Last month, he sent me several photos of Gur-e Dokhtar, where an Achaemenid tomb can be seen. The small monument is remarkably similar to the more famous mausoleum of Cyrus the Great in Pasargadae, but is interesting in itself. You can read Mr Charlot’s article here. I was in Trabzon when its football team, Trabzonspor, beat Inter Milan. I have never seen a city that went so completely out of its mind: people honking their cars and even the ships in the port sounding their horns. It’s an ancient city, originally called Trapezus. It became famous in the Middle Ages, when the Comnenian dynasty of Byzantine emperors settled in “Trebizonde” (as it was known back then) and made it the capital of a mini-empire, after Constantinople itself had been captured by the knights of the Fourth Crusade. In all aspects, Trebizonde had to resemble the real capital of the Byzantine world, which meant that there was also a lovely Hagia Sophia: smaller but more refined than its namesake in Constantinople. You can still visit the place. There’s nothing left from the Greek and Roman age, but the city has an interesting history. You can read more about it on my new page: here. In 2011, I wrote a book called De klad in de klassieken, “Classics in Decline”. It is about the way classicists, archaeologists, and historians try to guarantee that their information is adequate. The seven first chapters deal with their craftmanship, the three final ones with the problems they are facing in the Dutch, bureaucratic universities. The book was published in January 2012. Below is an English synopsis; a Dutch summary is here. Scholarship is in a state of crisis and the first branch that is no longer capable of keeping up with the others, is the study of Antiquity. This is not just the problem of classicists, Biblical scholars, archaeologists, Egyptologists, Assyriologists, historians, and so on. The causes of the decline of the classics are relevant to other branches of scholarship and science as well. What is the study of Antiquity? Subdisciplines. Poliziano and the origin of textual criticism; Nanni and source criticism; Erasmus; Pyrrhonism; antiquarianism and the widening scope of history; the Enlightenment. Linguistic interpretation of ancient texts; cultural interpretations; intertextuality; subjectivity; Schleiermacher’s hermeneutics; Dilthey; formalism; oral literature. The fifth main problem: outdated information, because of (among other factors) outdated hermeneutic approaches. Eyewitness accounts and primary sources; secondary sources; facts, indirect facts, aggregated facts; logical problems with empirical study; from fact to language; problems with historicism; acceptance of wide comparisons; justification of comparanda; need to collaborate with the social sciences. From antiquarianism to archaeology; Schliemann; archaeology as the handmaid of history; Kosinna; Childe; culture-historical archaeology and nationalism. Collaboration with the social sciences breaks historicism (a way to solve main problem #4); decisive changes (functionalism, Clark, radiocarbon); spatial archaeology (Iraq-Jarmo Project); the so-called New Archaeology; possibility to say meaningful things about continuity (a way to solve main problem #3); postprocessual archaeologies and hermeneutics; classical archaeology until 1970; Snodgrass; archaeology no longer a subdiscipline of classics (solution to main problem #2); Greece no longer considered the cradle of civilization; more attention to the ancient Near East (solution to main problem #1). Just when four of the five main problems were potentially solved, new problems arose. the Convention of Valletta caused an archaeological data explosion. We’re living in an age in which outdated information can spread faster than reliable information, while academics are less capable to fight against disinformation. How things went wrong. Failure of quality control;* underfunding;* disadvantages of bureaucracy;* no control whatsoever of the information sent out to the larger audience. Must we accept the end of the classical studies? No, but reform is necessary and possible. Scholarship should serve society, but the present Dutch universities are a Procrustean bed. What to do? Form follows content: only when we know what we really want, we can create a new system of study. Independent institutes are better than large universities. If creating an institute for all classical studies, is only possible by making it an elitist institute, that is acceptable. Make sure that the larger audience understands what scholarship is about. Create efficient types of control, not focused on the amount of articles published every year, but on the correctness of information that is circulating in society. Subjects indicated with * are also relevant to other fields of scholarship. I have never been to Zone, in the northwest of Greece, but I recently received an article and some photos from Mr Michel Gybels from Belgium. The town was settled in the seventh century BC by people from Samothrace, served as port of trade for the Thracian hinterland, and floutished in the early Hellenistic period. I loved the figurine of the satyr on the panther shown to the right: it’s perfect and beautiful. The new webpage is here. You are currently browsing the archives for the Livius.Org category.